How can the USAF ensure that AvB and AvIP use resources efficiently to sustain the pilot force? How can it determine the efficient amount of S&I pays for a rated officer career field given the cost of producing an additional trained and adequately experienced rated officer, as well as the retention behavior of rated officers? An alternative to relying on retaining current pilots to sustain the size of the U.S. Air Force's (USAF's) pilot force is to access and train new pilots. But expanding the pilot training pipeline is costly, so, ultimately, the USAF faces a trade-off between increasing pilot accessions and incurring greater training cost or increasing pilot retention and incurring higher special and incentive (S&I) pay costs, as well as the higher personnel cost of a more senior force. For a given-size pilot force, the determination of the efficient level of S&I pays and whether it is more cost-effective to train new pilots or retain those already in the force depends on the cost of training; personnel costs, including the cost of S&I pays; and, importantly, how responsive pilot retention behavior is to increases in Aviation Bonus (AvB) and Aviation Incentive Pay (AvIP). To ensure that AvB and AvIP use USAF resources efficiently to sustain the pilot force, the USAF asked RAND Project AIR FORCE to develop an analytic capability for determining the efficient amount of S&I pays for a rated officer career field given the cost of producing an additional trained and adequately experienced rated officer, as well as the retention behavior of rated officers. This report summarizes the analysis in response to this request. The authors recommend that the USAF explore where training cost savings might be found (e.g., perhaps through alternative training technologies) without jeopardizing USAF capability and readiness. The cost of training a basic qualified fighter pilot ranges from $5.6 million for an F 16 pilot to $10.9 million for an F 22 pilot. Bomber pilot training cost is also high, ranging from $7.3 million for a B 1 pilot to $9.7 million for a B 52 pilot. Transport and mobility pilot training cost is somewhat lower, ranging from $1.1 million for a C 17 pilot to $2.5 million for a C 130J pilot. Training cost per pilot for command, control, intelligence, surveillance, and reconnaissance operations (e.g., the RC 135) is about $5.5 million. For each of the pilot specialties considered, increasing AvB to increase retention was more efficient than expanding the training pipeline to sustain a given pilot inventory, over the range of AvB amounts considered. Were pilot training cost lower — $1 million, in the case of fighter pilots — per capita cost would not continue to decline as AvB increases, and, in fact, the efficient level of AvB would be $40,000 per year of additional commitment. It is efficient to increase the AvB cap to at least $100,000 to retain midcareer fighter pilots in the steady state. The share of pilots who are experienced is larger in the early transition years, when S&I pays, rather than the size of the training pipeline, are increased, although the experience mix of pilots is more senior in the steady state. The research reported here was sponsored by the Military Force Management Policy Directorate; Manpower, Personnel and Services; Headquarters, U.S. Air Force, and conducted by the Manpower, Personnel, and Training Program within RAND Project AIR FORCE. 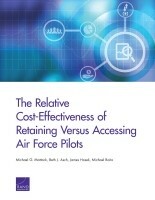 Mattock, Michael G., Beth J. Asch, James Hosek, and Michael Boito, The Relative Cost-Effectiveness of Retaining Versus Accessing Air Force Pilots. Santa Monica, CA: RAND Corporation, 2019. https://www.rand.org/pubs/research_reports/RR2415.html. Also available in print form.